2016 12 05 [Article] Enriching our Constitution. 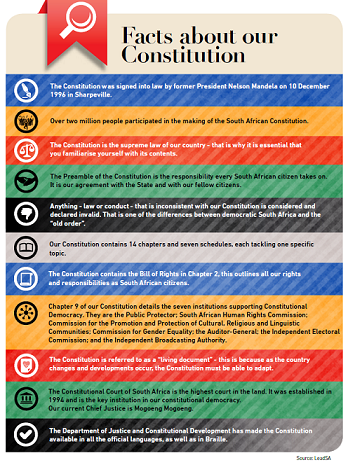 Over the past 20 years there have been amendments to the South African Constitution. Each new amendment was made with the intention to improve our justice system and create a better life for all South Africans. 2016 12 05 [Article] What does our Constitution provide for and building awareness of Constitutional rights. 2016 06 01 [Event] Orange Farm community engaged on Constitution. 2016 03 22 [Article] LGBTI community firmly on the agenda.